The best pack for the best adventurers! This is an incredible experience full of emotions and andrenaline to make your summer, easter, or christmas holidays a full unique experience. Let´s combine a Canyoning activitiy in one of our wonderful rivers and a Via Ferrata over one of our mountain trails where you will be challenged to jump, rappel, cross monkey bridges and the intense and breathtaking landscape and high views. You can choose between all our canyons and add to it the exciting Casares´s Via Ferrata, located on this incredible white village on “valle del Genal” from where you can have views of Gibraltar and African shores. You have over ten canyons to choose on our list “Canyons” in all Andalusia. If you haven´t checked it out yet and want more information, our main canyons are: Guadalmina Level 1, Buitreras Level 2.5, Rio Verde Level 2 or Rio Verde x-pro Level 3, if you´re located in Malaga, Granada or Cadiz. We do canyoning activities all year, and we also have interesting special summer offers for 1 participant or even small groups. If you choose Guadalmina canyon it will be an easier to experience the whole package in the same day. If you´ve chosen some other canyon you will have to Schedule the Via Ferrata in an other day. 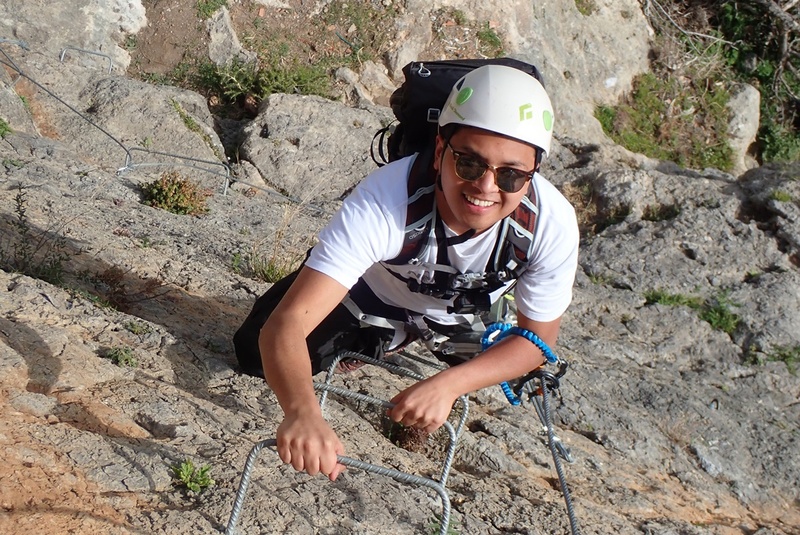 You can Schedule your Via Ferrata in summer all Tuesdays, Thursdays, Saturdays or Sundays. Outside of the summer season it can be scheduled every day. On the meeting point at Casares (if you don´t choose our transfer service), your guide will assist you and will provide you all the gear required for this challenge; helmet, harness and lanyard. After a short walk on the trail, and reaching the starting point, your guide will explain to you how to use the gear we will provide and how to use it on all the climbs. You will feel safe and well assisted! Casares Trail is a nice Via Ferrata (medium level) where you will find two monkey bridges, one is 25 meters long, horizontal stretches and some parts uphill until we reach the peak of the mountain. This Via Ferrata is recommended for people looking to begin this sport and enjoy a new way of climbing without the hard requirements that rock climbing demands, which also needs a higher technical preparation. This Via Fierrata is also recommended for kids and teens from 11 or 12 years old and <155cm tall if you´re an adventurer family! After finishing the Via Ferrata we invite you to a typical “tapa” of “ensaladilla rusa” and a cold soda on the village square, the best way to end an adventure day in Malaga. Remember that in summer, Marbella and Malaga have much more than just beaches, so come enjoy all the potential that our rivers, mountains, forests and the wonderful white villages! Note: In order to book this package we need a minimum of 4 participants, if your group is smaller contact us to join another open group. (*) The cost of the Via Ferrata if you would like to set it as single activity is 50€/p. Terms of booking: At least 4 participant for a booking.